Editor's Note: This is the first in a new series from Julianna Morlet that examines and suggests songs for both corporate and personal worship. Feel free to let us know in the comments if there are selections you'd like Julianna to write about! When a worship song makes you feel like the writer was looking through a window in your home and wrote the song about you, that's a good worship song. Relatability. Were they in my head? 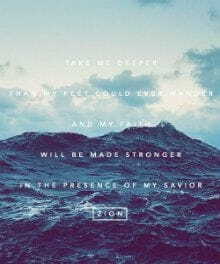 It's no mistake that Hillsong's Oceans (Where Feet May Fail) is on the list for the Top Worship Songs of 2013, So Far. With countless testimonies about both melody and lyrics touching lives, Oceans has hit a nerve within the global Church. There is depth to its message. Lines like, "You never fail, and You won't start now," and "Spirit lead me where my trust is without borders," Oceans shatters the porcelain faith so many of us struggle to maintain. It's an honest cry for growth and grace. Christians tend to fear that which defines us: grace. We fear giving it and we fear receiving it from others. This song gives us the words and melodic passion to say, "Hey, I don't have this figured out and you don't either, but I know my only hope is keeping my eyes and heart and mind and strength on what God has called me to." It's musically well written. Some can argue that Hillsong (and Hillsong United) follow a very close pattern and formula, brinking on redundancy, in their song writing. However, it works. It's a perfect combination of fresh and familiar. It's female led. When a man and a woman lead a co-ed congregation, it unlocks something in a congregation, allowing both genders to open up and experience God. It may be what your people need. There is something to be said for seasonal worship. As church leadership steps into their community and identifies the seasons of life their community is in, they can better prepare for effective Sunday mornings. This song may be just the words your congregation needs to identify with right now. It's New. Staying current on worship movement is as important as bringing hymns to the surface. Music styles come and go quickly in this generation, but we must always be moving forward. Christians should be leading the way in musical advance, for we have direct access to the Creator of music (Psalm 33). New music allows your church and the global Church to express itself in new and creative ways. Hillsong United - Oceans (Where Feet May Fail), feat. Taya Smith from bobmarshall on GodTube. Let's Chat: Have you done this song with your church already? How'd it go? Julianna Morlet is the girl behind the lifestyle blog, The Girl That Sings. Her blog is focused on her journey as a homemade singer, writer, speaker. Julianna also blogs about worship and other topics at Crosswalk.com.